Jack in the Box® is taking its award-winning Buttery Jack line to new, bacon-filled heights with its latest signature burger, the NEW Triple Bacon Buttery Jack™. Jack in the Box® is taking its award-winning Buttery Jack line to new, bacon-filled heights with its latest signature burger, the NEW Triple Bacon Buttery Jack™. A burger unlike any other, the Triple Bacon Buttery Jack boasts a first-of-its-kind secret ingredient, real bacon butter! Jack has revolutionized the way we eat bacon with the NEW Triple Bacon Buttery Jack. Jack marries the slices of hickory-smoked bacon with savory, melted bacon butter. Rounding out the trifecta, the burger is then topped with a delicious bacon mayo. The Triple Bacon Buttery Jack features a quarter-pound beef patty, grilled onions and cheddar cheese, all on a gourmet signature bun. It's got the craveable flavor of bacon in every bite! "We knew we were on to something special when we created the Buttery Jack line," said Iwona Alter, Chief Marketing Officer at Jack in the Box. "The new Triple Bacon Buttery Jack builds on our legacy of buttery burgers, offering a unique and innovative twist with our secret ingredient, bacon butter. We think our loyal guests, as well as new customers, will love the burger's decadent flavors and standout ingredients." 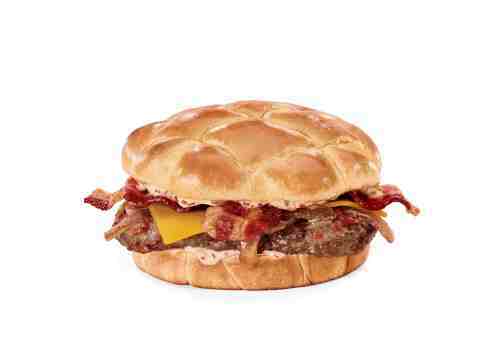 Jack in the Box will debut its commercial spot promoting the new Triple Bacon Buttery Jack exclusively on Facebook today. But don't forget to tune in to The Big Game on Sunday, February 5, when the commercial will air on television for the first time. The 30-second ad features two teenagers who successfully hack into their favorite food icon's personal email. Within Jack's email, the teens uncover the recipe for the new Triple Bacon Buttery Jack, and share it for everyone to enjoy! While in Jack's email, the teen hackers also find some of Jack's never-before-seen secrets and pictures. Head over to their page, JackiLeaks, to get a peek at what Jack Box has been up to. Jack in the Box Inc. (NASDAQ: JACK), based in San Diego, is a restaurant company that operates and franchises Jack in the Box® restaurants, one of the nation's largest hamburger chains, with more than 2,200 restaurants in 21 states and Guam. Additionally, through a wholly owned subsidiary, the company operates and franchises Qdoba®, a leader in fast-casual dining, with approximately 700 restaurants in 47 states, the District of Columbia and Canada. For more information on Jack in the Box and Qdoba, including franchising opportunities, visit www.jackinthebox.com or www.qdoba.com.